Be able to wash all pressed containers and cans with high pressure. To save space, cleaning and drying process is devided in 2 stages. In drying process, equipments have many improvement in draining large blower and and hot air drying. 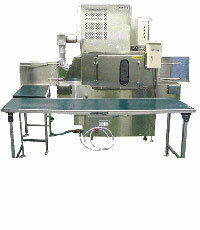 If a box have dimension W530*D366*H325mm, for per hour this machine could clean and dry more than 200 pcs. It is very economical to reuse the washing water to clean the outside and inside surface of each work. Based on hot water and high pressure so result of washing is very good. We propose thse products that meet the needs of all easy orders. 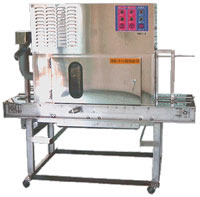 This type of machine have a good efficiency in washing many trays of food have size 500mm×500mm. High pressure washing on both surfaces of tray. After cleaning, trays shall be dried by air blower equipment. According to each order, we shall have optimum washing method. 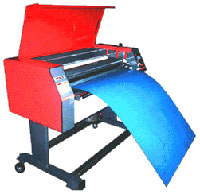 Have high economical efficiency in washing walking sheets using at exhibition area or in stores. Finish stage also being washed by brush is an outstanding. It has a built-in organization for draining, drying in good condition. Have many for size of works need washing. Have high efficiency in washing disaster prevention works at construction site. Because disaster prevention equipments have high value, so they should be recycled. Cleaning all dirts by washing with brush and high pressure method. Washing large equipments automatically, and shorten working time considerably. Clean large sashes simply! Corresponding to all orders easily! Have high efficiency in washing many aluminum sashes. If you put sashes into machine, they will be automatically washed by brush and dryed by hot air. For this type of machine, only need 2 workers, 1 person putting sashes into machine and 1 person taking out. This is a saving space machine, only need 1 worker, so it could be placed at any corner in factory. Outstanding with cleaning all dirt and drying! Drying process is setting strong air blow, so it is outstanding in drying trays. All parts related to water is made by stainless steel, so there is not worry about rust. Because using high pressure washing method, so although they are hard dirts, they still be cleaned off. Compare with normal machines, this type is the saving space machines. Only 1 worker could operate, so it is very simple. It is able to change specification in according to every washing work. It is able to change washing speed freely. Cheap value for all users.